As a result of numerous trips taken by the founders and Creators, Sylvie Ganter and Christophe Cervasel, to Asia and Middle East, they have created five new Colognes Absolue, all of which are a part of Atelier Cologne newest collection, Collection Orient inspired by the region’s natural beauty, people and customs, and particularly the most precious raw materials. The beauty and refinement of these carefully selected raw materials illustrate treasured emotions and powerful memories, source of inspiration for the creators. Atelier Cologne’s iconic flacon has been reinvented for Collection Orient. The glass is colored white reflecting modernity and purity. The golden caps pay tribute to the preciousness of the ingredients carefully selected to create each Cologne Absolue. Poivre Electrique is built around chords of pepper – black bitter pepper and flirtatious, vibrant pink pepper, followed by an oriental union of resins, precious wood, incense and Turkish rose. Vibrant pepper is framed with bitter and optimistic zests of bitter orange. 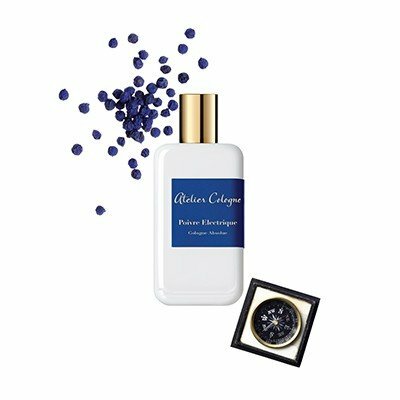 Fragrances of the collection ATELIER COLOGNE COLLECTION ORIENT are available as 30, 100 and 200ml Cologne Absolue (20% vol), as well as in gift sets. Flacons of 30ml are ‘dressed’ in leather case. Poivre Electrique was launched in 2016.